Saga Prefecture (佐賀県, Saga-ken) is a prefecture in the northwest part of the island of Kyushu, Japan. It touches both the Sea of Japan and the Ariake Sea. The western part of the prefecture is a region famous for producing ceramics and porcelain, particularly the towns of Karatsu, Imari, and Arita. The capital is the city of Saga. -In ancient times, the area composed by Nagasaki Prefecture and Saga Prefecture was called Hizen Province. The current name dates from the Meiji Restoration. Rice farming culture has prospered here since ancient times, and vestiges can be seen at the ruins of Nabatake in Karatsu and the Yoshinogari site in Yoshinogari. -From the Kamakura period to the Muromachi period, it is thought that over 100 feudal clans existed. Also exerting great influence during this time was a samurai clan operating along the Genkai Sea called the Matsuratō. Upon entering the Sengoku period, the Ryūzōji clan expanded their control to include all of Hizen and Chikugo Provinces, and part of Higo and Chikuzen Provinces. After the death of daimyō Takanobu Ryūzōji, Naoshige Nabeshima took control of the political situation, and by 1607 all of the Ryūzōji clan's domain was under the control of the Nabeshima clan. -In the Edo period this area was called the Saga Domain (佐賀藩 Saga-han), and it included three sub-domains: the Hasunoike, Ogi and Kashima Domains. Also within the current borders of Saga Prefecture during this time were the Karatsu Domain (唐津藩 Karatsu-han) and two territories of the Tsushima-Fuchū Domain (対馬府中藩 Tsushimafuchū-han). Saga Domain and its sub-domains continued to be ruled by the Nabeshima clan, its various illegitimate family lineages and members of the former Ryūzōji clan, and politically the area was relatively stable. However, the cost of defending Nagasaki was increasing and, difficult from the start, the financial situation was worsened by the great Kyōhō famine and the Siebold Typhoon of 1828. Nevertheless, due to the large area of reclaimed land from the Ariake Sea arable land was able to increase significantly and by the 1840s the annual koku of Saga Domain increased to about 670,000, twice that of 200 years before. Around the middle of the 19th century, Naomasa Nabeshima strove to set right the domain's financial affairs, reduce the number of government officials, and encourage local industry such as Arita porcelain, green tea, and coal. Also, thanks to the proximity of the international port of Nagasaki, new technologies were introduced from overseas, such as the reverberatory furnace and models of steam locomotives. After the Boshin War, many people from Saga Domain assisted in the Meiji Restoration. In the Meiji era the modernization of coal mines in Kishima and Higashimatsuura districts, among others, progressed bolstered by the construction of railroads. Eto Shimpei in Saga. Woodblock print from Tokyo Nichinichi Shimbun, 1874. 665: After losing the Battle of Baekgang, Kii Castle (in present-day Kiyama) amassed its defenses to protect Dazaifu. 1591: Construction of Nagoya Castle. After the Japanese invasions of Korea the castle fell in 1598. 1602: Construction of Karatsu Castle and Saga Castle. 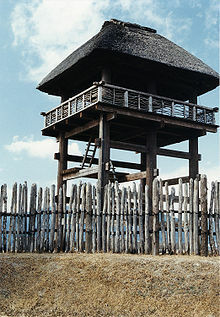 1607: Control of Saga Domain moved from the Ryūzōji clan to the Nabeshima clan. 1781: Establishment of Kōdōkan, the Saga Han school. 1828: Heavy damage from the Siebold Typhoon, deaths estimated at over 10,000. 1871, July 14: Abolition of the han system. All of the han became prefectures. 1871, November 14: The prefectures of Saga, Hasuike, Ogi, Kashima, Karatsu and part of Tsushima merged to form one prefecture, Imari Prefecture. 1872, May 29: Imari Prefecture renamed Saga Prefecture. 1876, April 18: Incorporation of Mizuma Prefecture. 1883: Separation from Nagasaki Prefecture. 1889, April 1: The city of Saga is founded. 1891: The Kyushu Railroad Nagasaki Line opens, beginning with a section from Tosu to Saga. 1895: Opening of railroad from Saga to Takeo. 1897: Opening of railroad from Takeo to Haiki. 1903: Opening of railroad from Saga to Nishi-Karatsu. 1932, January 1: The city of Karatsu is founded. 1935: The Japanese National Railways Saga Line opens. 1954: During the Great Showa Merger the cities of Tosu, Imari, Takeo, Kashima and Taku are formed. At this point there are 7 cities, 8 districts, 18 towns and 35 villages in Saga Prefecture. 1972: With the closing of the Nishiki coal mine, all coal mines in Saga are closed. 1975: The Genkai Nuclear Power Plant begins operation. 1987: The Japanese National Railways Saga Line closes. 1992: The Yoshinogari History Park opens to the public. 1998: The Saga Airport opens in Kawasoe, in what is now the city of Saga. 2005: As a part of the Great Heisei Merger various municipalities are reorganized. January 1: Karatsu and Shiroishi. March 1: Ogi and Miyaki. 2006: The Great Heisei Merger continues. January 1: Karatsu and Ureshino. March 1: Takeo, Yoshinogari, and Arita. 2007, October 1: The towns of Higashiyoka, Kawasoe and Kubota merge with the city of Saga. 2011, March 12: The Kyushu Shinkansen opens. Kyushu's prefecture, Saga, is located on the northwest corner of the island, bordered by the Genkai Sea and the Tsushima Strait to the north and the Ariake Sea to the south. Saga's proximity to mainland Asia has made it an important gateway for the transmission of culture and trade throughout Japanese history. Largely rural outside of the two largest cities of Saga and Karatsu, agricultural and forested lands comprise over 68% of the total prefectural land area. There are six prefectural parks and one quasi-national park in Saga. Forest, rough lands: 49.2% – 1/3 of the national average. Forested area: 1096.9 km2 – From 2000, 42nd in the country. Arable land: 39.1% – 2 times the national average. Residential: 6.8% – 1.4 times the national average. Other: 4.9% – Roughly the same as the national average. As of March 31, 2008, 11% of the total land area of the prefecture was designated as Natural Parks, namely the Genkai Quasi-National Park and Hachimandake, Kawakami-Kinryū, Kurokamiyama, Sefuri-Kitayama, Taradake, and Tenzan Prefectural Natural Parks. Saga Prefecture has a mild climate with an average temperate of about 16 °C (61 °F). Map of Saga Prefecture showing municipal boundaries. As of October 1, 2007, there are 10 cities, six districts, and 10 towns in Saga Prefecture, a total of 20 municipalities. As a part of the Great Heisei Merger, the number of municipalities has decreased since January 1, 2005. On March 20, 2006 the village of Sefuri merged with the city of Kanzaki, leaving Saga with no more villages. Agriculture, forestry, and coastal fisheries form a large portion of the prefectural economy. Regional agricultural specialties include Saga beef, onions, and strawberries. The prefecture is the largest producer of mochigome (sticky rice) and greenhouse mandarin oranges in Japan. According to 2002 figures, regional trade exports are focused primarily towards North America (29.3%), Western Europe (26.1%), and the Newly Industrializing Economies of South Korea, Taiwan, Hong Kong and Singapore (19.9%). Imports come principally from North America (40.6%), the ASEAN nations (23.3%), and the People's Republic of China (12.2%). As of 2002, the census recorded a population 873,885 in Saga. Of these, 15.9% were aged 0–14, 62.7% were age 15–64, and 21.4% were over 65 years old. There were 3,596 foreigners (0.4%) and 307 exchange students (0.03%) living in the prefecture. Major stations in the prefecture include Saga Station, Tosu Station, Karatsu Station and Imari Station. The new Kyushu Shinkansen line stop at the Shin-Tosu Station. Arita, Imari and Karatsu are famous for the beautiful porcelain that is created there. The top porcelain houses in the country are located in these areas, including Imaemon Porcelain, Genemon Porcelain and Fukagawa Porcelain. Saga-ben (Saga-dialect) is Saga's own variation of Japanese. The Saga International Balloon Fiesta is held at the beginning of November every year just outside Saga City along the Kase River. This is a very popular event and attracts competitors from all over the world. The Karatsu Kunchi is held at the beginning of November in Karatsu City. This is Saga's most famous festival and attracts around 500,000 visitors every year. The Kashima Gatalympics are held every May–June in the city of Kashima. This event involves playing a variety of sports in the mudflats of the Ariake Sea. The Gatalympics are not held if the weather is raining. The Imari Ton-Ten-Ton Festival is held for 3 days every year near the end of October. Located in Imari City, the festival is one of the three great fighting festivals in Japan. In the festival a crashing battle takes place between the two huge portable shrines, the Ara-mikoshi and the Danjiri. The name "Ton-Ten-Ton" represents the sound of drums used in the festival. Teams listed below are based in Saga Prefecture. Karatsu, with its fine castle, is a popular tourist destination in Saga. The remains of a Yayoi village in Yoshinogari also attract large numbers of sightseers. Another place to visit is Yūtoku Inari Shrine, one of Japan's three biggest Inari shrines. Comedian and J-Pop singer Hanawa became famous for comically singing about Saga Prefecture and its oddities. Former TV personality Masashi Tashiro was born in Saga Prefecture. World War II fighter ace Saburō Sakai was born in Saga Prefecture. Actress and J-pop singer Yasuko Matsuyuki and her younger brother, J-pop/rock singer Yuna Katsuki (of Lazy Knack and Red), are from Saga city. "The Seven Wise Men of Saga" is the name given to these seven men from Saga, each of whom have made a significant contribution to the modernisation of Japan. Their contributions began in the last days of the Tokugawa Shogunate, and continued into the Meiji Restoration. Even today, this era shines impressively in Saga's history. Lord Naomasa Nabeshima, feudal lord of the Nabeshima clan, helped to bring about the development of Saga through introducing European technology and culture. Sano Tsunetami founded the Japanese Red Cross. Shima Yoshitake contributed to the exploration of Hokkaidō. Soejima Taneomi served the roles of Diet member, Foreign Minister, Minister of Domestic Affairs and was well known for his Chinese Poetry and talented writing skills. Ōki Takatō was Minister of Civil Affairs, Education and Legal Affairs, held the position of a Diet member and made considerable contributions to the establishment of the modern education system in Japan. Etō Shimpei, also once a Minister of Legal Affairs, became a Diet member and created the foundation for Japan's judicial system. Ōkuma Shigenobu served two terms as Prime Minister of Japan. He also established Waseda University. ^ a b Nussbaum & Roth (2005), "Saga prefecture", p. 804. ^ Nussbaum & Roth (2005), "Provinces and prefectures", p. 780. ^ Nussbaum & Roth (2005), "Saga no ran", p. 804. ^ a b c "The Saga Sightseeing Information: Nature". Saga Tourist Federation Information Center (Tourism Division). Archived from the original on September 8, 2014. Retrieved 26 September 2012. ^ "General overview of area figures for Natural Parks by prefecture" (PDF). Ministry of the Environment (Japan). 1 April 2014. Retrieved 4 February 2012. ^ "Yuna". Love Flare. 2005. Archived from the original on March 27, 2012. Retrieved June 10, 2015. Nussbaum, Louis-Frédéric; Käthe Roth (2005). Japan Encyclopedia. Cambridge, Massachusetts: Harvard University Press. pp. 780, 804. ISBN 978-0-674-01753-5. OCLC 58053128. Wikimedia Commons has media related to Saga prefecture.